Labour Day Projects are under way! The New Kingston Rotary Club along with the Rotaract club they sponsor, New Kingston Rotaract Club are currently painting a Pedestrian crossing on one of the busiest roads in New Kingston, Jamaica. Both clubs are part of the non-profit organization, Rotary International. Good work Rotarians and Rotaractors! Happy Labour Day Suga Bears! What’s your Labour Day Project? Have a productive day, whether at home or in the streets. The Rotary Clubs of New Kingston and Portmore will be hosting a Breakfast Fundraiser tomorrow morning on World Polio Day at 7:45am. Breakfast will be at the Altamont Court Hotel. The asking Contribution is $2500.00 and Proceeds will go towards the Fight to End Polio. Have Breakfast with a Purpose tomorrow and Enjoy your Day! The New Kingston Rotaract Club recently held an Awareness Campaign for expectant mothers, nurses and it’s club members on ‘Maternal and Child Health’, which is also one of Rotary International’s six areas of focus. 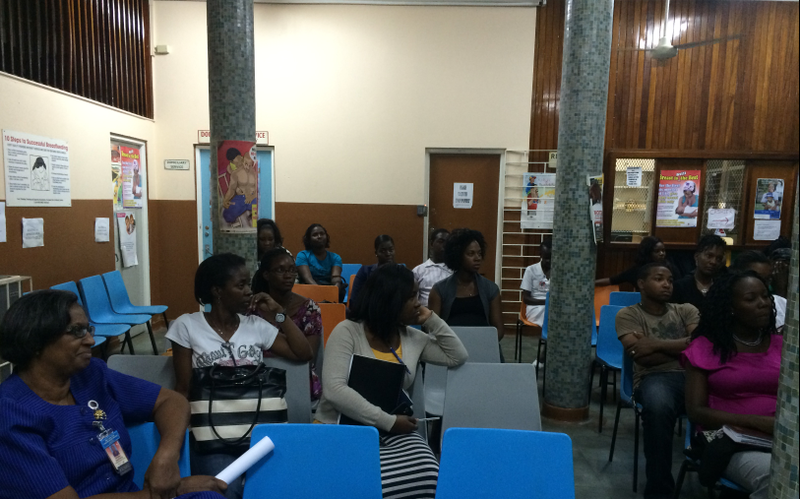 The Campaign was held at the University Hospital of the West Indies’ Antenatal Clinic. Professor Marvin Reid from their sponsoring Rotary Club, the Rotary Club of New Kingston, led the interactive presentation including topics such as Nutrition and the importance of breastfeeding, Immunization and Types of Contraceptives. Good work New Kingston Rotaract Club! Education is the key to our country’s success.